Romantic accent for bedroom, dressing room, outdoor areas. 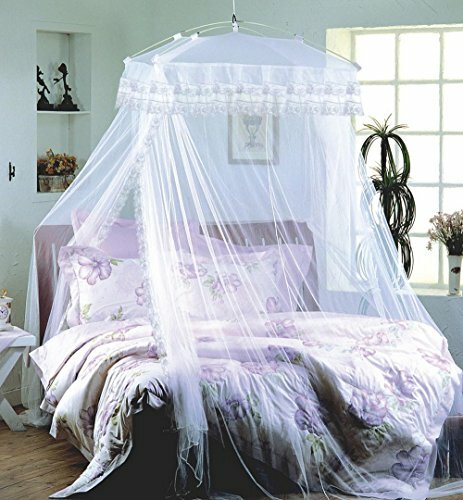 Nets installation method: Put two fiber rod stretched, Cross on the mosquito net four corner surface, Crossing bed nets top each side has 5 sets, Insert two fiber rod respectively on top of mosquito net in one side of the cross has five sets.it can hang up! General Suitable for 1.5 M and 1.8 M and 2 M Ned Nets, If it is 1.5 Meters Bed Can Put a BB Bed in 1.5 Meters Bed Sharing this Net Use! Hang from the ceiling with supplied hook. it usually take around 7~10 working days for the item arrive you. If you have any questions about this product by bed canopy net, contact us by completing and submitting the form below. If you are looking for a specif part number, please include it with your message.